If you squint your eyes a bit, you can blur out modern-day bourgeois Winchester, its preoccupation with property prices and the frequency of trains to Waterloo. What’s left is a vibrant medieval city, which often claims to be the historic capital of England. (As a native of Leofric’s Mercia, I suspect that claim is over-inflated, but I’m not one to pursue tribal disputes). I took a walk up St. Giles Hill on a crisp, clear day. It sits just at the edge of the urban centre. It’s a short, steep climb, so the view from the top feels like that from a tall spire, rather than a distant hill-top. One could almost throw a stone through the Cathedral windows, or toss back a ball to the floppy-haired public-school boys at the College. The plateau of the hill was, during the 13th and 14th centuries, the site of St Giles Fair. Barbara Carpenter Turner’s History of Winchester explains the significance of the fair. Merchants came from all over England, and even from Ireland, most of them trading in wool or cloth. … There were Frenchmen, Spaniards and men from the Low Countries. They brought in wine, spices, silks and other luxuries of medieval life, for this was one of the four most important fairs in England. 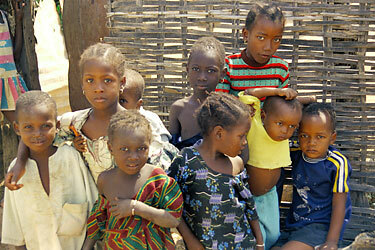 Several years ago Caroline and I visited The Gambia. Our friend Jo took us up-country by Land Rover, stopping at the town of Farafenni. Farafenni sits at the crossroads of ancient trade routes, and is host to a market, one of the most important in West Africa. It attracts traders from all over the region: the lanky Wolof from Senegal, Fulani, Mandinka and the blue-hooded and cloaked Tuareg from the North. Stalls spread far into the distance, selling fabrics, spices, a few scrawny vegetables and some livestock. Diesel may have largely replaced the camel, indeed the nearby crossing of the Gambia river resembles Calais in a port strike, but otherwise the same scene must have existed for centuries. What struck me as I climbed St Giles Hill was that Europe and Africa operated surprisingly similar economies a few hundred years ago, yet have drastically diverged. And that’s not meant pejoratively. I doubt the Africans are distraught that they lack the finer achievements of modern life: the M25, out-of-town shopping and Pot Noodles. Martin Wolf, the FT columnist and author of Why Globalisation Works, is the toast of Threadneedle Street because (it’s claimed) he has comprehensively demolished the anti-globalisation argument. Naomi Klein (they say) is history. I confess, I haven’t read Wolf’s book yet, but I have studied some of his data. Wolf’s seductive argument is that those countries that have embraced globalised industrial development — notably India, China and the South East Asian nations — have reduced poverty and decreased inequality. To his credit, Wolf measures wealth (or poverty) in terms of purchasing power parity, a more robust definition than those who ignore relative cost-of-living. I imagine one could live more lavishly on ‘5,000 a year in Kerala than ‘50,000 in Kew. I wish I understood these things, and so Small Is Beautiful is on my reading list, along with Why Globalisation Works.